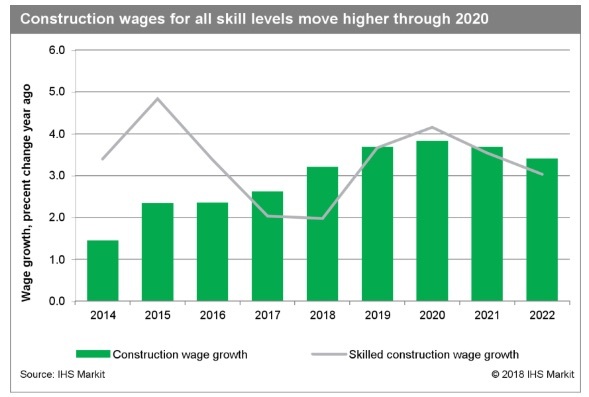 IHS Markit reports construction industry wages, which averaged 3.2 percent growth in 2018, will continue to move closer to the 4 percent growth mark in the next three years. Lower-skilled workers will experience the strongest growth due in part to minimum wage increases on both coasts. From a regional perspective, the West Coast boasts the nation’s fastest employment growth, averaging 5 percent annually through 2020 (i.e., 56,000 more construction workers per year). Skilled wage gains will average 3.3 percent between 2018 and 2020 led by welders, electricians, pipefitters and boilermakers. IHS Markit predicts New England, the Gulf Coast, the Midwest and the Southeast will have skilled wage growth in the range of 3 percent to 3.3 percent during the next two years. Overall construction employment growth in the Mid-Atlantic region will trail behind most of the country, averaging 2.8 percent through 2020.